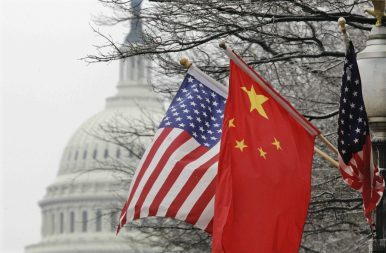 The Capitol dome is seen at rear as Chinese and U.S. flags are displayed in Washington (Jan. 18, 2011), ahead of the arrival of China's then-President Hu Jintao for a state visit hosted by then-President Barack Obama. The genesis of the United States’ Asia Reassurance Initiative Act (ARIA) was a series of hearings in 2017-18 held by Senator Cory Gardner (R-CO), the chairman of the U.S. Senate Foreign Relations Committee’s Subcommittee on East Asia, the Pacific, and International Cyber Security. ARIA, approved by the Senate on December 4, 2018, and approved by a voice vote in the House of Representatives on December 12, after amendment, has now become law. The Senate approved the amendment on December 19, after which U.S. President Donald J. Trump signed the bill into law on December 31. ARIA has the objective of requiring the Trump administration “to develop a long-term strategic vision and a comprehensive, multifaceted, and principled United States policy for the Indo-Pacific region…” It complements and, in many respects, advances the more general U.S. National Security Strategy released by the White House in late 2017 and the National Defense Strategy released by the Pentagon in early 2018. But it also includes new initiatives and priorities in the Indo-Pacific region. ARIA is a good example of the U.S. Congress exercising oversight over the Executive through authorizing expenditure for specific activities, requiring annual reports on a number of security issues, and mandating specific strategies to achieve U.S. objectives. To support Human Rights Defenders ($1 million). ARIA also mandates annual reports by the government and its agencies in seven areas: a strategic framework for engagement with the Association of South East Asian Nations (ASEAN); justification after termination of any sanctions directed at North Korea; strategy for negotiations with North Korea on ballistic missiles; terrorism in Southeast Asia including the capabilities of the Islamic State (ISIS) and al-Qaeda linked groups; intellectual property protection with special reference to China; regional engagement through the Lower Mekong Initiative; and Indo-Pacific human rights defenders. Several of the mandatory reports also include the requirement to develop a strategy and to report back on the implementation of this strategy. Finally, in terms of oversight, ARIA calls on the Trump administration to develop strategies in five priority areas: (1) deepen trilateral security cooperation between the United States, South Korea, and Japan including on missile defense, intelligence sharing, and other defense related initiatives; (2) Indo-Pacific diplomatic strategy involving U.S. allies; (3) a comprehensive, integrated, and multilayer Indo-Pacific energy strategy; (4) an ASEAN strategy to promote human rights, democracy, and good governance; and (5) a strategy to address threats from North Korea. ARIA will play an important – if not decisive – role in shaping U.S. national security policy toward the Indo-Pacific region because only the U.S. Congress can appropriate funding and Trump and the Executive will be required to implement the law. First, ARIA unequivocally recognizes the vital importance to the security of the United States of treaty allies (Japan, South Korea, Australia, the Philippines, and Thailand), strategic partners (India), enhanced security partnerships (Indonesia, Malaysia, Singapore, and Vietnam), and commitment to Taiwan. With respect to Taiwan, the Bill significantly calls for the transfer of “defense articles” and high-level official visits. In its discussion of the U.S.-Australia alliance, ARIA engages in a bit of legislative legerdemain by referring to the Security Treaty Between Australia and the United States by omitting New Zealand from the treaty’s official title ­– Security Treaty Between Australia, New Zealand and the United States (known colloquially as ANZUS). The brief discussion of U.S.-New Zealand relations was relegated to a later section. Here reference was made to the Wellington Declarations of November 2010 and June 2012 as the basis for bilateral commitments but not the original ANZUS Treaty of September 1951. In short, the drafters of ARIA missed an opportunity to suggest how the United States could develop its defense and security ties with New Zealand in line with its advocacy of similar measures for other states in the Indo-Pacific region. The United States suspended its treaty obligations under ANZUS in 1986 after New Zealand adopted a policy of prohibiting visits by nuclear-armed warships. The ANZUS treaty has not been abrogated, however. At the same time, the ARIA Bill maintains the fiction that Thailand is a treaty ally by referencing the defunct Southeast Asia Collective Defense Treaty of September 1954. ARIA highlights the U.S.-Republic of Korea-Japan Trilateral Security Partnership and the Quadrilateral Security Dialogue (involving the United States, Australia, India, and Japan), but it omits any reference to the U.S.-Japan-Australia Trilateral Security Dialogue. China’s illegal construction and militarization of artificial features in the South China Sea and coercive economic practices. The increased presence throughout Southeast Asia of the Islamic State… and other international terrorist organizations that threaten the United States. expresses grave concerns over Chinese actions that seek – (a) to further constrain space for civil society and religion within China; and (b) undermine a rules-based order in the Indo-Pacific region. is committed to working with China on shared regional and global challenges, especially – (a) upholding and strengthening the rules-based international system; and (b) the denuclearization of North Korea. Third, ARIA elevates the importance of American values (democracy, freedom of the press, universal human rights, good governance, the rule of law) and international norms in shaping U.S. diplomatic strategy in the Indo-Pacific region. Specifically, ARIA expresses serious concern over the rule of law and civil liberties in five countries – Cambodia, China, North Korea, Laos, Thailand, and Vietnam. More significantly, ARIA highlights “unacceptable human rights developments” in Myanmar, the Philippines, and China. The Bill also prohibits the use of funds for specific U.S. programs in Myanmar (International Military Education and Training and Foreign Military Financing), the Philippines (counter narcotics assistance to the Philippines National Police), and Cambodia (funding that benefits the government). As noted above, ARIA allocates funding to support human rights defenders, who are defined as “individuals working alone or in groups, who nonviolently advocate for the promotion and protection of universally recognized human rights and fundamental freedoms if the advocacy of such issues may result in the risk of safety or life.” ARIA also appropriates funds for people-to-people initiatives that support these values. Fourth, ARIA unequivocally commits the United States to engage ASEAN as a part of the region’s “problem-solving regional architecture.” ARIA highlights three central components of engagement: the United States-ASEAN strategic partnership, countering terrorism in Southeast Asia, and capacity building for an ASEAN human rights strategy. Fifth, ARIA clearly endorses U.S. engagement in multilateral approaches to issues such as natural resources, energy, and trade, and specifically supports the Lower Mekong Initiative. ARIA’s endorsement of multilateral trade agreements stands in stark contrast to Trump’s advocacy of bilateral trade agreements. ARIA also notes that Congress supports “the proactive, strategic and continuing high-level use of the Asia Pacific Economic Cooperation forum, the East Asia Summit and the Group of 20 to pursue United States economic objectives in the Indo-Pacific.” It was notable that in 2018 Trump failed to attend the APEC leaders’ meeting and the East Asia Summit. The Asia Reassurance Initiative Act 2018 received bipartisan support in both chambers of the U.S. Congress. It is the first coherent U.S. diplomatic strategy for the Indo-Pacific region. In continuity with past U.S. national security and defense strategies, ARIA places priority on relations with treaty allies and strategic partners across the Indo-Pacific region in addressing the challenges posed by China‘s destabilizing activities including joint maritime training and freedom of navigation operations in the Indo-Pacific region including the East China Sea and South China Sea, combating international terrorism, and North Korea’s nuclear and ballistic missile programs. ARIA also places priority on upholding ASEAN’s centrality in regional affairs and developing an effective engagement strategy. While critical of China, ARIA also opens the door for cooperation between Beijing and Washington. ARIA places American values at the heart of U.S. diplomacy – democracy promotions, human rights, good governance, and the rule of law. ARIA also promotes legal and regulatory reforms to promote free and reciprocal trade. Finally, the Asia Reassurance Initiative Act will hold the Trump administration, including the secretary of state, accountable for its implementation through funding appropriations, annual reports to Congress, and the development and review of strategies to meet the Bill’s objectives. *Corrected the date from 2013 to 2023, and changed “appropriates” to “authorizes”. Thanks to reader Tom for pointing this out.